Hi everyone! The week seems to be moving quite fast. It feels like we greeted each other "Happy New Year" yesterday and today, it is already January 9th...time waits for no one. I need to start working on my “to do list” for the year, which includes setting up and organizing a new closet space. This should have been completed last year but I kept procrastinating. During the weekend, hubby and I finally made it to IKEA and we got the fixtures for my new closet space. Whenever I visit IKEA, I am always tempted to buy unnecessary things because I am a bit obsessed with interior decorations. Right now, I am on the search for a zebra print rug (I need you help). I am really excited about my new closet space and I promise to share pictures once the installation guys are done. Lately, I have been leaning towards black and white combinations as shown in this post. Styling black and white is always easy and I don't think you can really go wrong with such mixes. 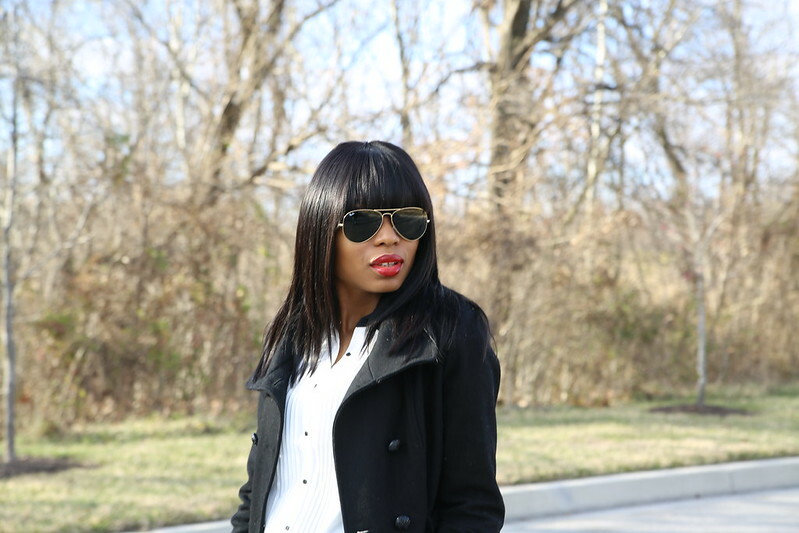 In this post, I wore a Zara black and white print pants. You will not believe how long I have had the pants – since January 2012! That was the first time I wore it-- I have no idea why I waited so long. :) I also wore my tuxedo-inspired white blouse with black collar from Forever 21 and I completed the look with my favorite black pumps by Louboutin. You look fabulous! You're right time flies! love love your tuxedo pants!! they look awesome on you!! this B&W is awesome!! you did that girl! My God! I'm in love with the pants. Can't remember seeing you on it. Love how you styled it! Looking forward to seeing pics from your closet. Lovely chic outfit, love those printed pants. How funny I just did the same closet space making last weekend LOL I love your graphic pants! So freaking cool! Black and white is always classic! I recently rebuilt my closet with the help of my dad's contractor. It was fun at first but organizing and color coding my clothes was a tideous task. Good luck! Can't wait to see the final product. Gorgeous pants, you look amazing! Gorgeous and I love your pants and ring! i instantly fell in love with your style and now following cause of it. we share similar tastes, so i am looking forward to your posts. excited about your closet project, hope all goes well, cant wait to see and read all about it. If these are your black and white outfits, then keep them coming! Those pants are absolutely amazing- too bad they're sold out! You look so chic and sophisticated. And yay on getting more closet space! I'd convert a whole room into a closet a la the Kardashians if I could. It's so hard to remember all the pretty pieces you have unless they're right in front of you. I can't wait to see how it turns out! I just loooooooove the pants! You look great! You look great! I absolutely LOVE those pants. I am used to seeing that print in home decor but never on clothing but I absolutely love it!!!! Very chic ! I love the pants. I can't wait to move to my new place and build my little own heaven too. AH-MAZING! Wow, you look incredible! I love every little detail of this look! You look stunning! Love those pants and the whole look!!! Keep it up dear. WOW! You make black and white so interestingly unique and fabulous!!! In love with the pants and shoes!!!! You look great, love those pants!! I can't tell you enough how much I love Zara (their price tags are the enemies) but even that, I still love Zara. Their pants and shoes and bags and jewelry are always on point. I need me some Zara as we speak. I am completely obsessed with your outfit! so chic! The trousers are gorgeous! Great look completely. :) Have a lovely weekend. Love your style! Would you like to follow each other? Kisses! This outfit is just cool! Love it! Black and white. Timeless classic. Love the pant. Looking gorgeous as usual. Fabulous pants. Love the black side panels and the prints. Love that bold ring you have on. I absolutely LOVE those pants!!! Fab look! Very Cute. Love the pants and more so I alove mixing high and low brands .. Forever21 and CL. Love it. And congrats on your soon to be new edition.